It's called the 'Beyond Famous Star." The limited-time burger, dubbed the Beyond Famous Star, will be available from now through Thursday, January 31 at roughly 1,100 Carl's Jr. locations. And while the patty itself is completely plant-based, the Beyond Famous Star is vegetarian, not vegan; it comes topped with melted American cheese, lettuce, tomato, sliced onions, dill pickles, special sauce and mayonnaise on a seeded bun. 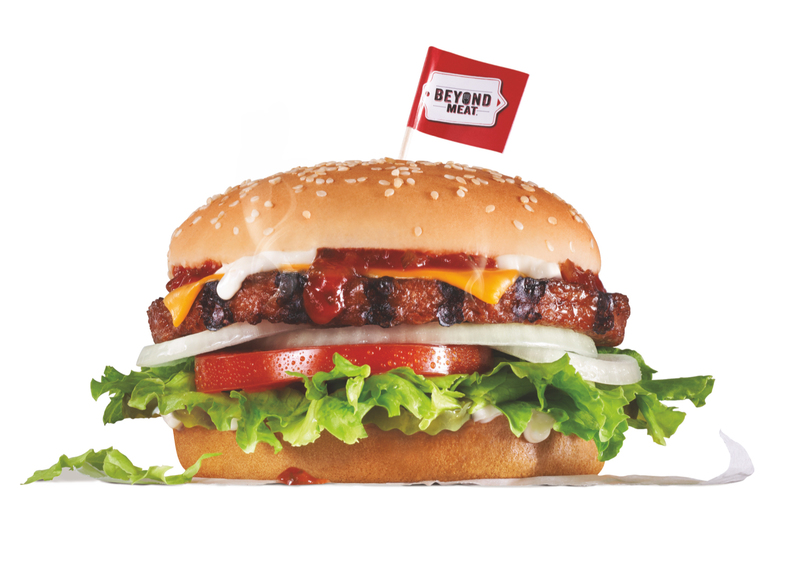 “We know people are looking for options—in fact, roughly one-third of consumers identify as flexitarians—and we’re thrilled to partner with Beyond Meat to bring more delicious, irresistible flavors to our menu,” Jason Marker, CEO of CKE Restaurants (Carl's Jr.'s parent company) said in a statement. He has a point about Beyond Meat fans' flexitarian (a.k.a. plant-based with the occasional inclusion of meat) eating tendencies. According to a Carl's Jr. press release, retail data from one supermarket chain this summer found that more than 90 percent of customers who purchased the Beyond Burger also purchased animal-based protein.